Waller County is included in the Houston-The Woodlands-Sugar Land, TX Metropolitan Statistical Area. Although a majority-white county, it is home of the HBCU Prairie View A&M University. According to the U.S. Census Bureau, the county has a total area of 518 square miles (1,340 km2), of which 513 square miles (1,330 km2) are land and 4.4 square miles (11 km2) (0.8%) are covered by water. As of the 2000 Census, 32,663 people, 10,557 households, and 7,748 families resided in the county. The population density was 64 people per square mile (25/km²). The 11,955 housing units averaged 23 per square mile (9/km²). The racial makeup of the county was 57.83% White, 29.25% Black or African American, 0.49% Native American, 0.38% Asian, 0.02% Pacific Islander, 10.28% from other races, and 1.76% from two or more races. About 19.42% of the population was Hispanic or Latino of any race. Of the 10,557 households, 35.10% had children under the age of 18 living with them, 55.70% were married couples living together, 13.00% had a female householder with no husband present, and 26.60% were not families. About 21.00% of all households were made up of individuals, and 7.50% had someone living alone who was 65 years of age or older. The average household size was 2.79 and the average family size was 3.25. In the county, the population was distributed as 25.70% under the age of 18, 18.10% from 18 to 24, 26.40% from 25 to 44, 20.50% from 45 to 64, and 9.40% who were 65 years of age or older. The median age was 30 years. For every 100 females, there were 98.70 males. For every 100 females age 18 and over, there were 96.10 males. The median income for a household in the county was $38,136, and for a family was $45,868. Males had a median income of $34,447 versus $25,583 for females. The per capita income for the county was $16,338. About 11.50% of families and 16.00% of the population were below the poverty line, including 20.00% of those under age 18 and 12.30% of those age 65 or over. Igloo Corporation, a manufacturer of cooling and portable refrigeration products, is headquartered in unincorporated Waller County between Brookshire and Katy. In 2004, Igloo announced that it was consolidating its corporate, distribution, and manufacturing operations in Waller County. Goya Foods has its Texas offices in an unincorporated area of the county near Brookshire. District 18: Lois Kolkhorst (R)- first elected in 2014. District 28: John Zerwas (R)- first elected in 2006. A history of controversies exists regarding the reluctance of county officials to allow students attending historically black Prairie View A&M University to vote in Waller County. In 1971, after the 26th Amendment extended the vote to those 18 years old and older, Waller County, which was home to Prairie View A&M University (PVAMU), a historically Black university, became troubled with race issues. Waller County's tax assessor and voter registrar prohibited students from voting unless they or their families owned property in the county. This practice was ended by a three-judge court in 1979. In 1992, a county prosecutor indicted PVAMU students for illegally voting, but dropped the charges after receiving a protest from the DOJ. In 2003, a PVAMU student ran for the commissioner's court. The local district attorney and county attorney threatened to prosecute students for voter fraud—for not meeting the old domicile test. These threatened prosecutions were enjoined, but Waller County then reduced early voting hours, which was particularly harmful to students because the election day was during their spring break. After the NAACP filed suit, Waller County reversed the changes to early voting and the student narrowly won the election. In 2007-08, during then Senator Barack Obama's campaign for president, Waller County made a number of voting changes without seeking clearance. The county rejected “incomplete” voter registrations and required volunteer deputy registrars (VDRs) to personally find and notify the voters of the rejection. The county also limited the number of new registrations any VDR could submit, thus limiting the success of voter registration drives. These practices were eventually prohibited by a consent decree. Brazos Valley Sudbury School was previously in operation in Waller County. Prairie View A&M University is the only university located within the county. The TTC-69 component (recommended preferred) of the once-planned Trans-Texas Corridor went through Waller County. Houston Executive Airport is located between Brookshire and Katy in an unincorporated area. Skydive Houston Airport (Skylake Airport) is located south of Waller in an unincorporated area. The Houston Airport System stated that Waller County is within the primary service area of George Bush Intercontinental Airport, an international airport in Houston in Harris County. In addition William P. Hobby Airport in Houston and in Harris County has commercial airline service. The Waller Times publishes local community news, school news, and sports news weekly on Mondays. It was founded in 1991 and is still family owned and operated. ^ "Contact Us." Goya Foods. Retrieved on March 26, 2016. "Goya Foods of Texas 30602 McAllister Road Brookshire, TX 77423"
^ "Fighting for the Right to Vote in a Tiny Texas County" by Vann R. Newkirk II and Adam Harris, The Atlantic magazine. ^ "Texas cops arrest Democratic campaign worker after asking his candidate's party affiliation". 2018-10-11. ^ McLemee, Scott (February 6, 2004). "Justice Department to Look Into Alleged Threat to Students' Voting Rights", The Chronicle of Higher Education 50 (22): A30. 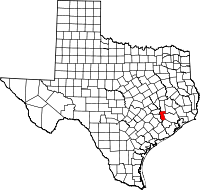 Wikimedia Commons has media related to Waller County, Texas.